We describe a capacitive coupled plasma reactor, where the inert gas molecules are ionized by the radio frequency radiation. The control and measurement system of electrical and optical parameters of the plasma are considered. A qualitative assessment is given of the energy distribution of charge carriers. Russian Text © S.T. 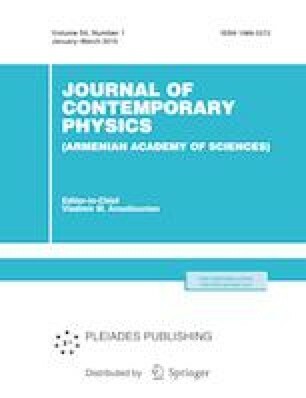 Sargsyan, 2019, published in Izvestiya Natsional'noi Akademii Nauk Armenii, Fizika, 2019, Vol. 54, No. 1, pp. 138–143.